Of the great singing societies formed in the waning years of the 1800s, only the Chopin Singing Society still survives. Where the Moniuszko, Lutnia, and Kolo faltered due to declining membership, one couple and their dedicated friends pulled Chopin’s from near death and into the twenty-first century. Their efforts not only preserved the culture and music of Poland, but has allowed the group to tour the world, record a number of albums and win national and international praise all while creating the modern Polish American traditions of Dyngus Day. In March of 1899, a small band of singers from St. Adalbert’s Church, joined parish organist Boleslaw Michalski in forming a secular singing society. They selected as their patron, one of Poland’s greatest musical geniuses, Frederic Chopin. The early years of the Chopin Singing Society were marked with small concerts the funds of which went to support the church. Early on they decided to join the national Polish Singers Alliance of America and established a home on Broadway. 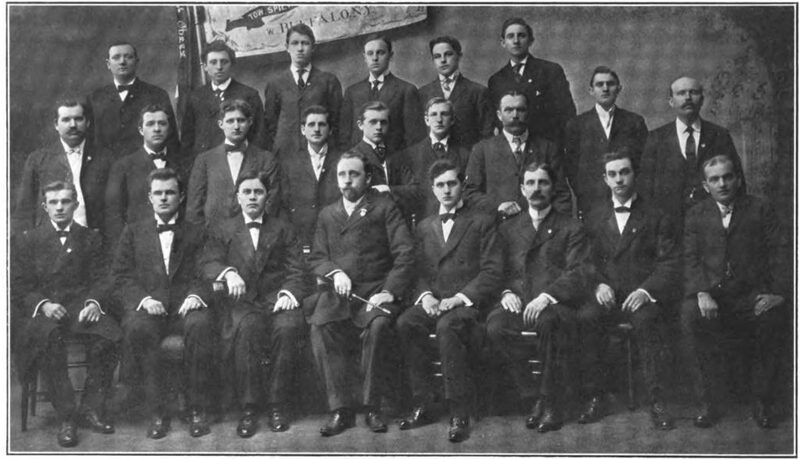 In 1908, with a 40-voice chorus they took second place at the alliance’s national competition. Chopin’s would sing at various events across Polonia, giving concerts, celebrating anniversaries, and holding picnics. In 1914, the society legally incorporated as a cultural and educational corporation. The work the singing society did for Polonia extended beyond the stage. In 1925, the society commissioned Buffalo artist Joseph Mazur to produce a bronze bust of Chopin that they could give to the city. On June 7, 1925 at Humboldt Park, in front of a crowd of 20,000 Mayor Schwab accepted the gift saying, “Buffalo is proud of its Polish colony because of its culture and high attainments.” The monument now resides on Symphony Circle in front of Kleinhans Music Hall. In 1947, because of the work of its membership, the Chopin Singing Society was able to purchase its own building at 18 Kosciuszko Street. One of the club’s more active members of this era was one-time congressman the first Polish American mayor of Buffalo, Joseph Mruk. The 1950s would see a decline in the membership of Chopin, until there were only 15 male singing members remaining in 1958. It was around that time that Ted Mikoll was recruited into the society who with his wife Ann would completely revitalize Chopin’s. The first thing the new young member did was institute a major recruiting campaign. The society also expanded its focus beyond traditional singing to emphasize folk songs and dances. Chopin’s began holding monthly parties to bring people in as well. Of these, none was more successful than their modern version of the post-Easter holiday, Dyngus Day. With a stronger member base Chopin’s began to sponsor a young pianists’ competition in 1965. They also began an intensive touring schedule visiting the Polish cities of Warsaw, Rzeszow, Czestochowa, Bydgoszcz, and Poznan; an American tour of Washington, Boston and New York; a pilgrimage to Rome, with a Papal audience; and a Mass at Monte Cassino, all in 10 years. At the same time they released two records, a self-titled album and one named, From Poland With Song. As east Buffalo saw a Polish decline at the end of the millennium, the society sold its building and moved outside the city. 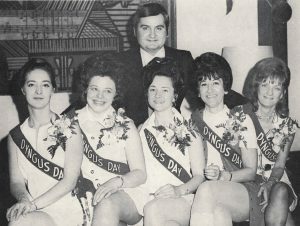 Today the Chopin Singing Society performs at venues across Western New York and still hosts the original Dyngus Day party that started it all. Blejwas, Stanislaus A. The Polish Singers Alliance of America, 1888-1998: Choral Patriotism. Rochester, NY: U of Rochester, 2005. Print. "Chopin Bust Unveiled In Buffalo Park." Buffalo Morning Express [Buffalo, NY] 8 June 1925: 4. Print. 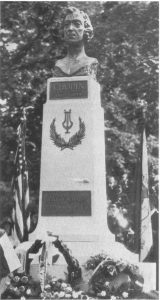 Commemorating the Unveiling of the Chopin Memorial by the Chopin Singing Society: Humboldt Park, Buffalo, New York, June Seventh, Nineteen Twenty Five. Buffalo: Society, 1925. Print. Gramigna, Glenn. "Chopin Singing Society Celebrates Centennial." Am-Pol Eagle [Cheektowaga, New York] 26 Aug. 1999: 6. Print. Towarzystwo Śpiewu Fryderyka Chopina 1899-1949. Buffalo, NY: Tow. Śpiewu Fryderyka Chopina, 1949. Print.